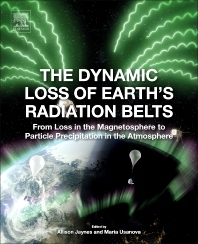 The Dynamic Loss of Earth's Radiation Belts: From Loss in the Magnetosphere to Particle Precipitation in the Atmosphere presents a timely review of data from various explorative missions, including the Van Allen Probes, the Magnetospheric Multiscale Mission (which aims to determine magnetopause losses), the completion of four BARREL balloon campaigns, and several CubeSat missions focusing on precipitation losses. This is the first book in the area to include a focus on loss, and not just acceleration and radial transport. Bringing together two communities, the book includes contributions from experts with knowledge in both precipitation mechanisms and the effects on the atmosphere. There is a direct link between what gets lost in the magnetospheric radiation environment and the energy deposited in the layers of our atmosphere. Very recently, NASA’s Living With a Star program identified a new, targeted research topic that addresses this question, highlighting the timeliness of this precise science. The Dynamic Loss of Earth's Radiation Belts brings together scientists from the space and atmospheric science communities to examine both the causes and effects of particle loss in the magnetosphere. Dr. Allison N. Jaynes is a professor in the Department of Physics & Astronomy at the University of Iowa. Her research involves spacecraft data and instrumentation used to investigate the near-Earth space environment. She obtained her PhD from the University of New Hampshire in 2013 after studying the Northern Lights in the specific form of pulsating aurora. She is serving as Co-Investigator on NASA’s MMS and Van Allen Probes spaceflight missions. Dr. Maria E. Usanova is a research scientist at the Laboratory for Atmospheric and Space Physics, University of Colorado at Boulder. She graduated with honors from the Department of Physics, Moscow State University (Russia) and received her PhD in space physics from the University of Alberta (Canada). Her research interests include the dynamics of energetic particles in the Earth’s radiation belts and ring current, mechanisms for particle acceleration and loss in the magnetosphere, inner magnetosphere coupling, and wave-particle interactions.